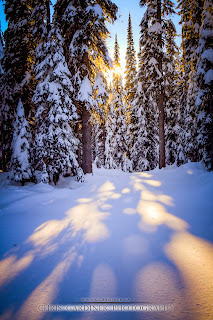 This is a scenic I captured from a day of snowshoeing around Big White's Nordic Trails. It was so early in the season we were breaking trail everywhere we went, which was kinda nice to know we wouldn't run into anyone either. Breaking trail also afforded me some views of nice wide pathway's through the trees with completely untouched beds of snow like the one above. Read on to see how I made this photo. A lot of my winter photography is captured 'on-the-go' while I am enjoying a day on my snowboard. So that means, I am definitely not using a tripod, and every extra minute I spend taking a photo is an extra minute I am falling behind, so composition is mostly on the fly, and being ready to snap a scene under the awesome lighting when I see it. Snowshoeing on the other hand, let me slow the day down, carry a tripod and take the time to set up the photos I wanted. The one above is a tonemapped composite image from three RAW photos. HDR photos are one of those things I never do on the mountain without a tripod, so I decided to change it up and shoot a few on this day. Hope you enjoy it! I have a few more on the way from this day.